Happy (almost) Halloween! Our apartment is decked out with pumpkins, mini gourds, ghosts and black (and tortoise shell) cats galore! Oh and I've been eating my fair share of mini candy bars. Yum. By far, my best and most elaborate costume was when I was E.T. in kindergarten. Of course I get no credit for this choice. I think it actually came to be because a family friend had the costume and let us borrow it. 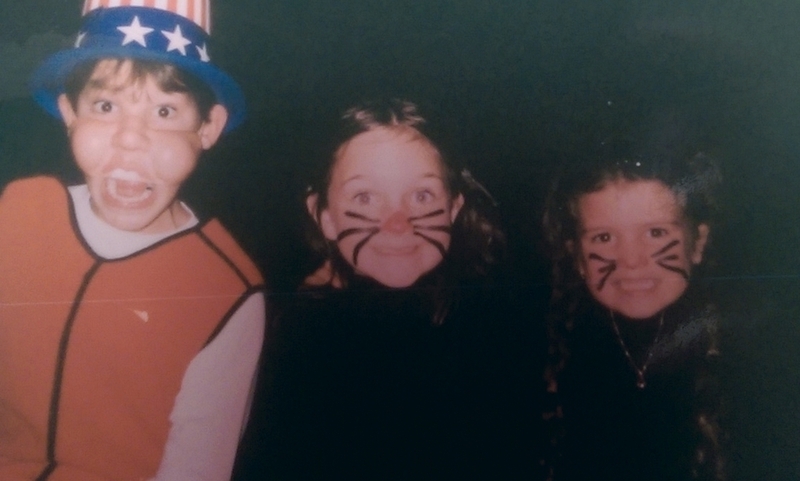 First grade through middle school was probably some combination of my cat/witch costumes? I know I was a devil one year in middle school. I'm going to say either 6th or 7th grade judging by the length of my hair. In 8th grade I was a lamb, and Nicole picked on me for it. Looking back, she was probably right in doing so. Take my word for it, eating pizza with fake nails is not easy! See - how cool is this!? I'm not sure I can see out of it, but look at the red index finger! Perhaps surprisingly, given my laziness towards Halloween costumes, I will be dressing up this year! However, I'm going to be applying my cat/witch attitude towards it, and will be putting in minimal effort. I keep saying that I'm saving all of my costume energy for when we have kids! In any event, I'll be posting pictures early next week. Get excited!! Do you like to dress up for Halloween? Do you tend to go the elaborate costume route, or for whatever is quick and easy?